As always, I will point out some things about the players. Many are shaking off the rust on the first day and I will report on these players again to mark their improvement. Kirill Ustimenko – 6-3, 179 – G – crouches quite a bit. He’s 6-3 so there’s still plenty of torso. He wraps his blocker on the outside of the post. (Jason Myrtetus pointed this out to me). Carter Hart – 6-1, 177 – G – Carter Hart always reminds me of Mike Richter. Even in drills he doesn’t want to be scored on. Richter would play tough in practice. He was cerebral and so is Hart. Adam Ginning – 6-3, 196 – D – For a guy of his size his stick and puck control is good. His backwards skating improved as the session went on, so it was clearly some rust. Jack St. Ivany – 6-1, 198 – D – I covered him in two All American Prospects games. So, I was familiar with him, but I wanted to see how he looks today. His skating is solid. He has very good stick and puck control. He’s self-critical in a good way. All good traits. Jay O’Brien – 5-11, 176 – C – He has a high ceiling. In the short passing drill, his were crisp and hard. He initially struggled shooting off the raised plastic. Once he got his stick flexing the right way his low wrist shot was wicked good. Matthew Strome – 6-3, 201 – LW – His shot is solid his skating still needs work. He has to work on his edges. If he can improve in this area it will get him that much closer to turning pro someday. 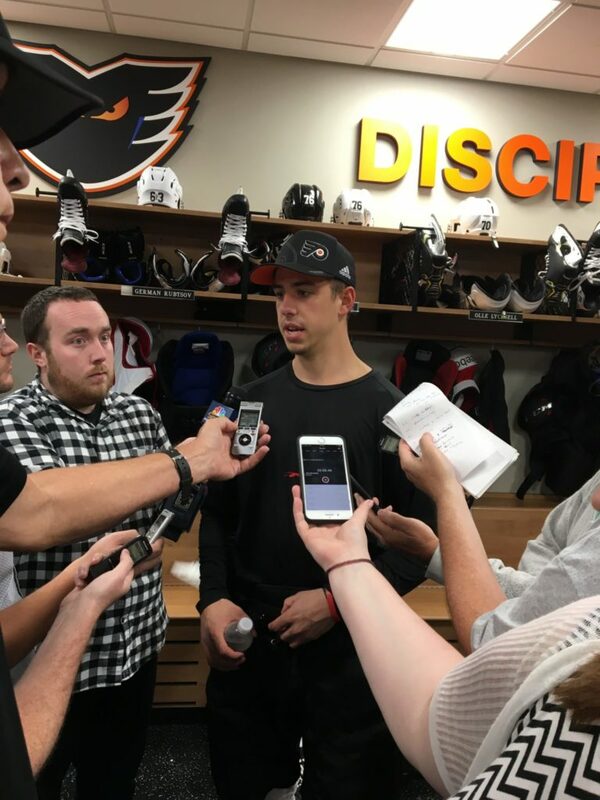 Morgan Frost – 5-11, 181 – C/LW – He’s heavier. You can see it (pictured above). I saw how much stronger he was shooting off the tee. His shot has real professional bite to it. His skating is better too. His training and hard work is showing off early results. I don’t think he will add much more weight. He can still get man-strength.